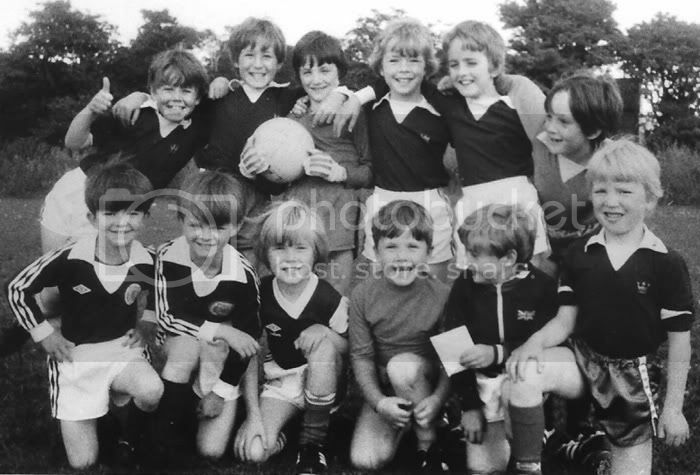 Received this photo of Longrow Boys FC (Under 8s perhaps) today to scan and share on the forum. Can you name the players? Most of them! Struggling with back row rhs and beside Mark? Back row maybe neil hutchinson front row reminds of kb but he wouldn't be playing for Longrow! Would he? kbm wrote: Back row maybe neil hutchinson front row reminds of kb but he wouldn't be playing for Longrow! Would he? You on about the first fella on the back row starting on the right? Look at it closer - staring at you and not Neil Hutchinson. Was a year above you. The fella on the front row to the left of Mark stayed in the town for a few years along Argyle Street. Robert Stevens. Is back row, far right Robert Sharp? Is that the Boo holding the ball? Sheik Yir Erse wrote: Is that the Boo holding the ball? Sheik Yir Erse wrote: Is back row, far right Robert Sharp? I was going to say how true, but I ended up the goalkeeper when we were under 11s! !